WHAT ARE THE BEST ONLINE BACHELOR'S IN WEB DESIGN PROGRAMS? What Will I Learn in an Online Bachelor's in Web Design? Since most people use the internet on a daily basis, it's no surprise that the web design field is booming. The Bureau of Labor Statistics reports a 27% growth rate for jobs in web development—much higher than average. An online web development degree helps students delve into web design to prepare for a career in the field. This page will guide you through the process of choosing the best online web development degree program for you. Best known for its flagship campus in Provo, UT, Brigham Young University (BYU) also operates branches in Idaho and Hawaii. The Rexburg, ID campus is home to the school’s online BS in web design and development, a broad program that explores graphic design, web business, web design, UX, object-oriented programming, software development, and the basics of CIT. Because the program awards an online web development degree, graduates of BYUI’s program can find work in IT, web design and development, and communications. The program requires 120 total credits for completion: 40 credits of general education courses, 54 major credits, and 26 elective credits. Though coursework uses asynchronous learning, students progress through the material together with a cohort, having regular checkpoints. The typical student takes four years to finish the program, but students can accelerate their progress by completing courses in summer terms. Admission is rolling, and students can apply to start for whichever term is next on the calendar: fall, spring, or summer. Arizona State University enrolls the sixth-most students of any public university in the nation. ASU’s size means it is a school with many resources, and Skysong is the school’s innovation and economic development-centered branch. Through ASU’s online campus, Skysong offers an online bachelor of science in graphic information technology program that requires 120 credits to complete. Students spend time on-campus to complete 30 of those credits. This online web development degree explores visual information and framing visual messaging. Students learn graphic design, web development, interactive technologies, and digital publishing, and ways to use these tools to convey targeted visual messages to specific audiences. A few of the courses include web authoring, digital publishing, and commercial photography. Graduates can find work as graphic designers, art directors, or even animators. Champlain College, in Burlington, VT, has become a major player in distance education. Their BS in web design and development is an asynchronous program for working adults who require flexibility in their coursework. The program offers seven-week courses that accelerate students’ progress toward their degrees. Champlain also makes the program work for each individual -- each student receives a dedicated academic advisor, and transfer students may apply up to 90 credits toward their degree. The curriculum consists of 120 credits, including 66 credits of professional courses and 54 credits of general education. Courses include ethical hacking and internet business relationships, in addition to standard coursework in web development. Competitive applicants to the program will have at least a 2.5 GPA, though students who demonstrate potential for academic success in other areas will also be considered. 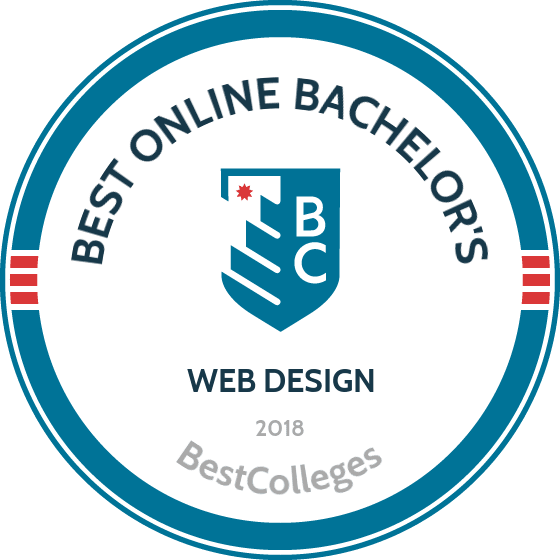 Independence University's online web design degree, the bachelor of science in web design and development, prepares graduates to work with the front and back ends of web design to ensure an aesthetically beautiful and technically seamless user experience. Taught by experienced faculty, courses explore topics in website design, graphic design, digital illustration, and database management. Because the curriculum is career-driven, it does not offer electives. This allows students to graduate in just 36 months and pay less than they would for other web design programs. Prospective students need to submit official transcripts from high school or, if applicable, previous college coursework. The university helps candidates request transcripts, and covers the cost as well. The application process also includes a financial aid application and a meeting with the director of admissions. As a nonprofit institution, Independence University strives to keep its tuition rates as low as possible. Students who pursue a web development degree online at Southern New Hampshire University receive a broad education. Upon graduating, they earn a BS in information technologies with a web design and development concentration. The 120-credit curriculum combines general IT courses -- database design, fundamentals of information technology, and cyberlaw -- with web development-specific coursework, such as website design, and web and mobile user experience. Graduates find work as web developers in any industry that needs websites or applications. SNHU’s flexible program uses asynchronous learning, and students can log on at their convenience to complete their assignments. The school year consists of six eight-week terms, and students can take as many or as few courses as they like. Completion times in the program vary widely, depending upon how many credits students take per term. SNHU also offers flexible transfer requirements: transfer students may apply up to 90 approved credits towards their online web development degree. Requirements for online web developer degree programs vary by program. However, there are general courses common to most web development programs. Below are a few sample courses and descriptions of how they prepare students for careers in web design. Introduction to scripting: Scripting is a skill necessary to programming and web development. This course teaches students to create simple scripts using common scripting language, which advanced courses build on. Students practice creating lists and expressions with basic scripts, and they encounter fundamental programming concepts and ideas. Cybersecurity: All web developers should understand basic cybersecurity concepts. This class introduces students to various threats to online security and to current policies and practices that protect information online. Cyberlaw: This course is an introduction to the policies, mandates, and laws that govern the internet. Students explore the ethical use of technological platforms, including information privacy. The course prepares students to code and create in an ethical, professional manner. Accreditation ensures schools and programs meet certain standards of education. Accreditation is essential to choosing a reputable school and program. Unaccredited schools or programs are generally nonreciprocal, meaning degrees and credits may not be recognized by other institutions or employers. A school can be accredited regionally or nationally. Regional accreditation is the more popular type; regional accrediting agencies are more widely recognized, and degrees and credits earned from regionally accredited schools are easily transferrable. The Department of Education and the Council for Higher Education Accreditation offer comprehensive lists of regionally and nationally accredited institutions. Choosing an accredited online web development degree program is required to receive federal aid. Earning a web development degree online opens doors to a number of career options. Web developers work in areas such as game and application development, web design, search engine optimization, and marketing. Successful web developers are often focused, driven, and good multitaskers. The list below details a few occupations for graduates of an online web development degree program. These professionals develop and design websites and platforms, working with website functions, interactive elements, performance, and other technical aspects. They may also create content for websites. An advanced degree provides the specialized skills necessary to perform these tasks. Software developers create, design, code, and implement new software technologies, often to be used across platforms. These programs may perform basic functions or may be creatively designed for specific tasks. Graphic designers work on computers and by hand to create visual concepts. They may create branding and logos for companies or artwork for publications. Graphic designers with web development backgrounds often work with website layouts. Computer programmers write and perfect the scripts and codes that allow computer programs to execute tasks. Some work exclusively with offline programs, while others work with both offline and web-based programs. Employers in this field generally require an advanced degree in web development. Many graduates of web design programs work in marketing, much of which takes place online. These professionals may use search engine optimization to promote businesses. They may also design and implement social media marketing campaigns targeting specific audiences. The web design field is not only exciting and growing steadily, but is also lucrative and offers competitive salaries for advanced degree holders. Earning a web development degree online is a great way to kickstart a web development career and earn one of the impressive salaries outlined in the table below. Financing a bachelor's degree can seem daunting, but simple steps can make paying for your degree easy. The first and most important step is to complete the Free Application for Federal Student Aid, or FAFSA. This application connects students with available federal funding, including grants, scholarships, and loans. Students pursuing their web development degree online may also find major-specific scholarships and grants offered by private organizations in the field. Completing the Free Application for Federal Student Aid (FAFSA) is a crucial first step for any student with financial needs. Our FAFSA guide features a step-by-step rundown on the process and answers to several frequently asked questions. All eligible institutions are ranked on a 100 point scale. A perfect score of 100 is earned by ranking #1 for all ranking factors.